As 2015 came to an end here at ASL, we took a moment to reflect on the variety of locations we shot, the video content we produced, and the relationships we made. We could only take a moment because we had a lot of work to get done in the nyc video production game! Last month we told you about our shoot with Lincoln Financial. We filmed three families and captured their stories about how love drives their financial decisions. Don’t forget to click the video at the top of the email to get a glimpse of our finished piece. Our January started with a continuation of our interview series with Henry Kissinger. In this interview, the former Secretary of State and National Security Advisor explained his role in China and negotiating trade policies with Chairman Mao and his diplomatic team. Kissinger mentioned that Mao rarely spoke, except to make an occasional joke in English, which he was learning at the time. Next we created a video highlighting Nielsen’s digital content ratings platform. We devised and produced six different scenes for the DCR video. We found the right mix of actors and locations for each scene. We even transformed our own office into a college dorm room and a corporate office space for two of the scenes. 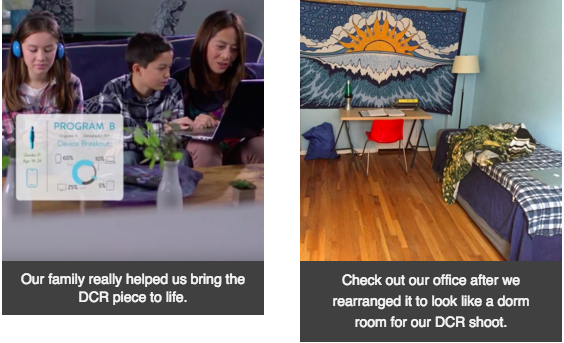 We ended up with a gorgeous video that accurately displays what and how Nielsen’s DCR platform helps its customers. We had two American Sports Network shoots come up that we were excited to tackle. The first one was a profile piece on Ashunae Durant, an undersized forward from Hofstra. The second focused on Maodo Lo, a German born shooting guard from Columbia University, who played on the German National team with Dirk Nowitzki. We also teamed up with the American Journal of Managed Care producing and directing a multi camera, green screen live stream. Like all ASL Productions, it was a success! At the very end of the month we started shooting profiles for New York Fashion Week with a media company called Vocativ. We have been interviewing fashion designers and models about their experiences and inspiration. Stay tuned for links and video highlights. The start of 2016 has been fast and furious! We are in pre-production for a bunch of really cool projects that we can’t wait to get off the ground and share with everyone. Don’t forget to like us on Facebook and follow us on our Twitter page. Stay tuned for more updates and for any information about ASL Productions, visit our website at ASLProductions.com or email contact@ASLProductions.com.